OTTAWA — Kyle Turris scored late in the third period, and Craig Anderson made 32 saves to help the Ottawa Senators to a 2-1 win against the Carolina Hurricanes at Canadian Tire Centre on Saturday. It was Ottawa’s third win in a row. Turris cut around Hurricanes defenseman Jaccob Slavin and beat goaltender Cam Ward with a wrist shot with 3:32 remaining to put the Senators ahead 2-1. The goal was upheld by video review after Carolina coach Bill Peters challenged it, claiming Ottawa was offside. Defenseman Dion Phaneuf also scored for the Senators (13-7-1). Sebastian Aho scored for the Hurricanes (8-8-4), who have lost back-to-back games after winning five straight. Ward made 22 saves. 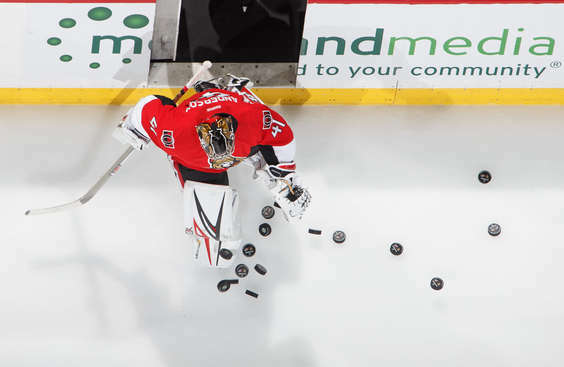 It was Ottawa’s ninth victory in a one-goal game, tied with the Chicago Blackhawks for the NHL lead. Phaneuf tied the game 1-1 at 6:15 of the second period with his second goal of the season. It came after the Hurricanes had spent the better part of two shifts in the Senators zone. Aho gave Carolina a 1-0 lead when he scored at 11:24 of the first period. Anderson made a save on Aho’s shot from a sharp angle, but the rebound went in off Ottawa forward Tom Pyatt, who was checking Jordan Staal’s drive to the net. Senators defenseman Erik Karlsson started the play on the winning goal, getting back to the puck in the left corner of the Ottawa zone. He passed ahead to Turris, who worked a give-and-go with Bobby Ryan along the right wing in the neutral zone, setting up Turris to split the defense and beat Ward for his 10th goal, third game-winner. Senators forward Zack Smith took a pass from Mark Stone late in the first period, broke in alone, and got Ward to go down with a fake to his left. Ward, on his stomach, got his right pad on the shot with 1:04 left. With the game tied 1-1 and about 8:50 left in the third period, Hurricanes forwards Jay McClement and Joakim Nordstrom broke into the Senators zone to chase down a puck chipped toward the net. Ottawa defenseman Mark Borowiecki read the play perfectly and got his body in front of McClement to prevent Carolina from getting a shot on the play. Karlsson played his 500th NHL game. … Senators forward Ryan Dzingel played after getting 35 stitches to close cuts to his left ear after he was hit by a deflected puck Thursday in a 3-1 win against the Boston Bruins. … Peters scratched forward Brock McGinn and replaced him in the lineup with forward Andrej Nestrasil, who had been a healthy scratch for six games. … It was the second time in November the Senators defeated the Hurricanes 2-1. Phaneuf and Turris scored the Ottawa goals in each game.